Retailers could see record web traffic this year, according to Deloitte’s 31st annual holiday survey of consumer spending intentions and trends. Among the findings: The internet gallops ahead as the top shopping destination; consumers surveyed are generally upbeat about the economy and their cash flow, but plan to rein in non-gift holiday spending; and online and in-store channels are becoming kindred spirits. See the full release to learn the findings from this year’s study. A team of expert surgical and medical providers at the Children’s Hospital at Montefiore (CHAM) have separated 13-month-old craniopagus twin boys Jadon and Anias McDonald. Craniopagus twins are joined at the head. This is the first time the team used virtual planning and 3D printing technologies to map their way through the boys’ attached brains in a series of complex, high-risk surgeries that resulted in complete separation on Oct. 14. Both boys are now recovering in CHAM’s Pediatric Critical Care Unit and while they could require further surgeries, the hospital community and family remain optimistic. See the full release to learn more about separating conjoined twins. The White House Historical Association, exclusive creator and manufacturer of the Official White House Christmas Ornament, continues the tradition of issuing the iconic collectible with the 36th ornament in the series. The festive design is inspired by fire trucks that responded to the 5-alarm West Wing fire on Christmas Eve 1929, and the toy fire trucks presented to children by President and Mrs. Hoover the following year. 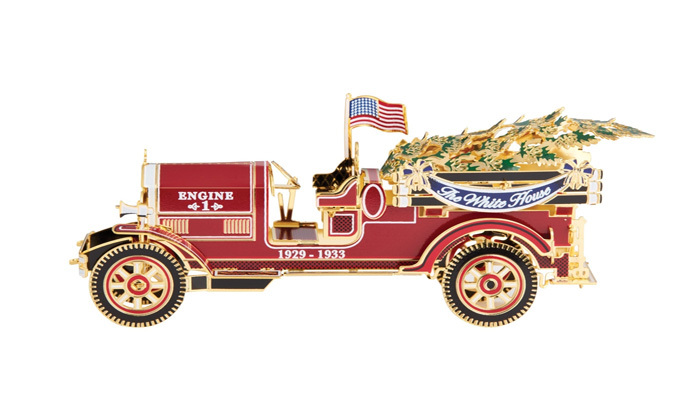 Recognizing President Herbert Hoover as the 31st President of the U.S. and honoring the more-than-100 firefighters who responded to the blaze, the 2016 White House ornament is crafted from shiny brass plated with nickel and 24k gold, and the fire truck carries a Christmas tree for delivery to the White House. See the full release to find out more about the ornament and the White House Historical Association. U.S. News & World Report on Oct. 25 released the 2017 Best Global Universities rankings. The overall rankings are the largest and most comprehensive assessment of research universities worldwide, evaluating 1,000 universities – up from 750 last year – across 65 countries. With 210 ranked universities, U.S. schools dominate the 2017 list and, for the first time, claim the top five spots: Harvard University leads at No. 1, followed by Massachusetts Institute of Technology at No. 2 and Stanford University at No. 3. The University of California-Berkeley comes in at No. 4 and California Institute of Technology rounds out the group at No. 5. See the full release for the full list of university rankings. This holiday season, Victoria’s Secret introduces the highly anticipated 2016 Bright Night Fantasy Bra. Victoria’s Secret Angel Jasmine Tookes will wear the Fantasy Bra for the first time on runway in the “Bright Night Angel” section at the 2016 Victoria’s Secret Fashion Show, which airs Dec. 5 at 10/9 Central on the CBS Television Network. The Bright Night Fantasy Bra was designed exclusively for Victoria’s Secret by celebrated jewelry designer Eddie Borgo and hand-crafted with jewels by AWMouzannar. Valued at $3 million, the 2016 Bright Night Fantasy Bra is adorned with over 9,000 precious gems, handset with diamonds and emeralds in 18-karat gold on a custom Beautiful by Victoria’s Secret bra. The bra took over 700 hours to create and weighs more than 450 carats. See the full release to learn more about making the bra and the fashion show.